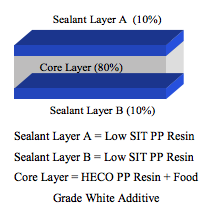 The RP423BX series of CPP films is a tough, 2-side sealable, coextruded film with excellent heat resistance and low temperature impact strength to –10 C. This CPP material is formulated with slip to promote downstream processing and is primarily intended as a sealant layer in laminations for retort food pouches and frozen food packaging applications including freezer-to-microwave. Available in clear and white-tint versions. - FDA 21 CFR 177.1520 (a)3(i), (b), (c)3.1a, (c)3.2a including food cooking applications under conditions of use A through H described in Table 2 of 21 CFR 176.170 (c).